When we bought a new condo a year ago the builtin bookshelf was the deciding factor. We homestyled our old place before we sold it and we sorted our bookshelf according to color. Should paperbacks be separated from hardcovers? Yes! Should we separate fiction from non-fiction? Absolutely! How should we sort the non-fiction? We selected a few categories: philosophy, autobiographies, geography, religion, IT, and law. Should fictional genres be separated? No, it is too difficult to decide which genre a novel belongs to, plus we would not have that many books for some genres. Is it ok that my Agatha Christie collection is kept together – with a mix of paperback and hardcover? Yes! (You would not dare to day no). Here is the result. We are already outgrowing our bookshelf and we have had to stack the books behind each other. We are not the only ones who have a passion for books and bookstorage. Just this past week I have come across several inspiring bookshelves. 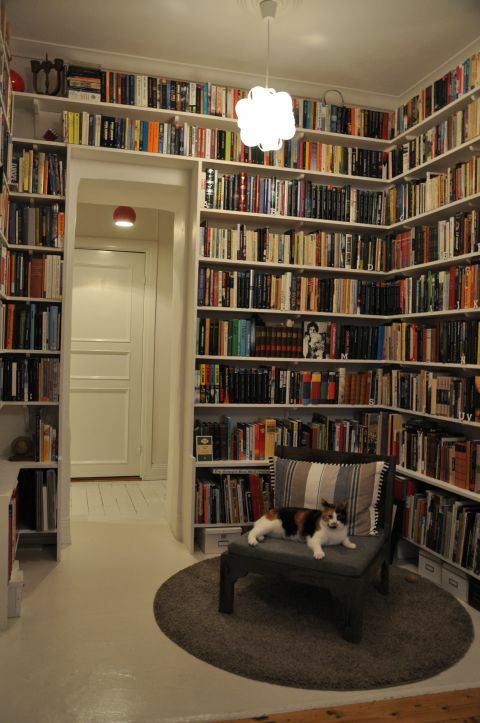 First, Sara showed me this link with incredibly beautiful bookshelves, and then Mattias from Piratförlaget (Swedish publisher) shared this link with living bookshelves. It is clearly the Era of Bookshelves! I want a built-in bookshelf like yours!